As can be seen the buildings are still present, with a few alterations, but they are no longer serving as the town’s post office. A little further east up the road there is the ’71 Club’ which offers some postal services today. Kelly’s Directory of 1900 shows us that the postmaster of Brancaster at that time was one Samuel Jacobs. The 1891 Census shows that there was a family named Jacobs living in Brancaster on London Street, which is back west up the main street, a short walk from the postcard location. The head of the family is Samuel, aged 39 and he was born in Alconbury Weston, Huntingdonshire. There is a son also named Samuel Jacobs, he is aged 14 and employed as a telegraph messenger. He was born in Brancaster. By the time of the 1901 Census, the son is living on the Main Road (the location of the postcard) and occupied as the postmaster stationer, which agrees with Kelly. As would be expected he is 24 years old at that time. His mother, named Fanny Jacobs, is shown as head of the household, there being no mention of Jacob senior his father. The public house some way up the road, as illustrated on the postcard, was the White Lion which ceased business in 1964. 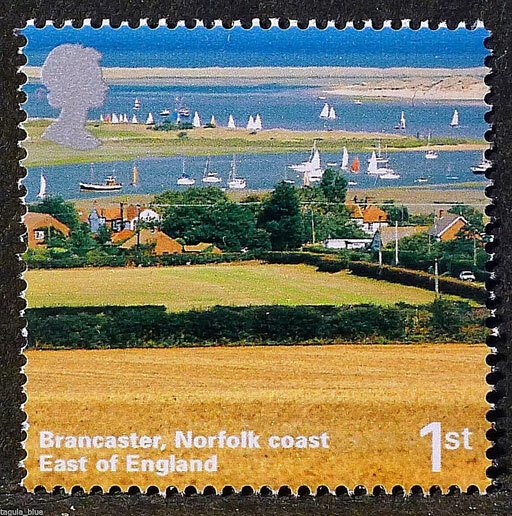 In 2006 Brancaster featured on a Great British stamp in a series of ten stamps entitled ‘A British Journey, England’. It is numbered SG2600 in the Stanley Gibbons GB catalogue. Many thanks to Alan Roome below in the comments for correcting me on the date – I’ll see if I can find a postcard earlier and closer to 1900. 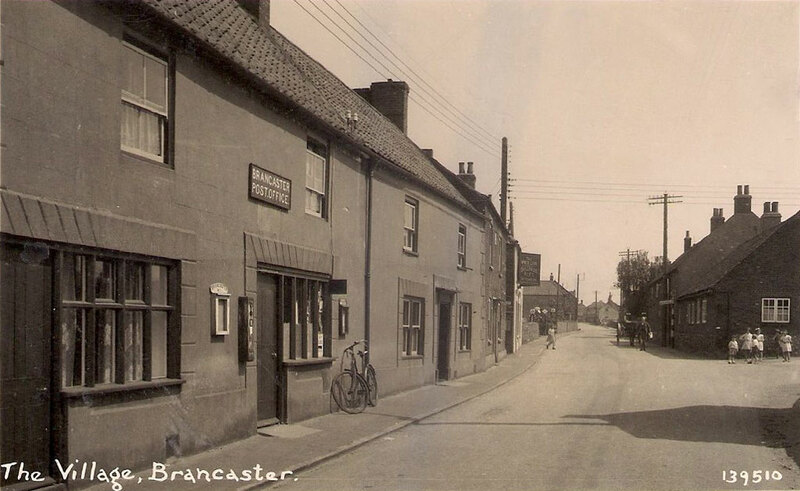 The postcard of the ‘Village Brancaster’ dates from the 1930’s. Mains electricity reached the village in 1937. The main road (now A149) is metalled. Telephone wires are in evidence, and the distant Garage has 1930’s type petrol pumps. Note the White Lion public house just beyond the Post Office. A nostalgic Post Card ! Thanks for the date and the extra information Alan, I’ll amend the date as I was a little off !